Extra Long Extension Posts 3cm - PIONEER-Extension Posts. 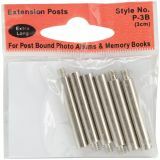 This package contains six Extra Long extension posts for post-bound photo albums and scrapbooks. Each post is 1-3/16 inches (3 cm) long. Style number P-3B. Imported.